This is what late night blog surfing gets you, another read-a-thon to join in on. This one caught my eye for two reasons: one, is that it's all about going back to books I wanted to read in 2015 but never managed to crack open and two, it follows right behind bought of books. I have a, after digging through the stacks, the trunk and the shelf, quite a few read from last year that I didn't get to. Now comes the task of picking the ones I can manage to get through in a week. Bought of Books has been good for me because it's gotten me back into the habit of reading that I seemed to have lost since the fall, and I'm hoping this newest one will also manage to keep in the habit. Which will make it easier to keep going as winter slowly decides to turn into spring. So what is the next read-a-thon to clog up everyone's Dashboards? It's called the Clean Slate Read-a-Thon and here are the details. So, what exactly is the Clean Slate Read-A-Thon? This read-a-thon is only for books that we didn’t get to in 2015…that were released in 2015. Any 2015 released we didn’t read is eligible for this read-a-thon. We want to start this year off with a clean slate so let’s get those 2015 released off our TBR and let it slim down! -The Clean Slate Read-A-Thon will be held from Sunday, January 10 at 12am (EST) till Sunday, January 17 at 11:59pm (EST). -We will be having mini-games along the way Novel Ink (Tuesday, January 12), Latte Nights Reviews (Thursday, January 14) and Lost in Lit (Saturday, January 16). You can join in on these if you want to, but they are not mandatory. You will get extra entries in the giveaway, though. -More details of the mini-games will be posted on the kick-off post, January 10. -There will be one big giveaway for those who participate. We also will be holding smaller giveaways for those who participate in the mini-games. -Sign up at Latte Nights Reviews, Novel Ink or Lost in Lit. You may join whenever you’d like, but to be eligible for the giveaway you have to be signed up by January 12. -Make a sign-up post and add your URL to the linky below! You can put your goals and progress (will be required for final giveaway) in your sign-up post. -If you want to follow along on Twitter or Instagram, use the #CleanSlateReadathon hashtag. 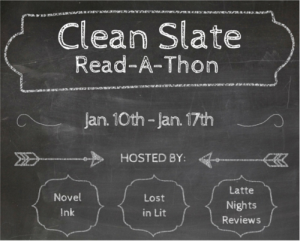 Clean Slate Read-a-Thon is hosted by three book bloggers: Lost in Literature, Novel Ink, and Latte Nights Reviews. Soon as the 10th rolls around I'm hoping to be able to post a TBR for this Read-a-Thon. I'm already pretty sure I know what I'm going to read since I just picked it up from the library, but I'm not sure if I'll only put that one book on the list. Mostly because it's a pretty big book.